Mark 8:36 “For what shall it profit a man, if he shall gain the whole world, and lose his own soul? In recent years we’ve seen how the Church has had an issue with keeping its flock in the pen with LDS leadership statements such as ‘they’re leaving in droves’. However, looking a little further back we see their troubles actually began long ago. Why would they need to plan a program such as ‘faith promoting works’ if there wasn’t a membership problem? Moreover, if they were teaching the truth about God, they wouldn’t have this issue! Jesus said the ‘gates of hell won’t prevail against my church’ — Matthew 16:18. 1.God’s Holy Spirit working inside everyone who believes in Him. 2.God’s Holy Word, aka, the Bible. This is the true faith promoting work! Christianity is an amazing organization if you care to look at historical evidence because its run by God, not man. 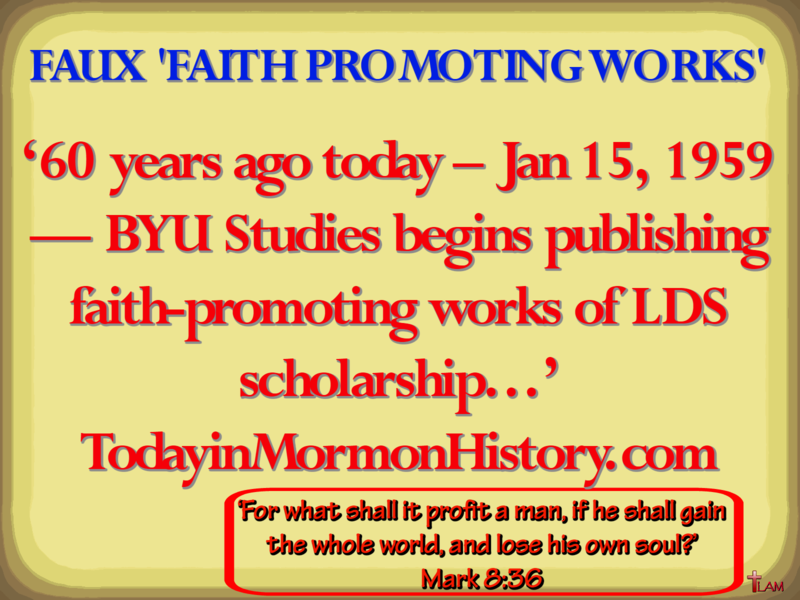 Pray for Mormons who are still buying into the faux faith promoting works of the evil one.